Did you know there are actually 3 different ways to pour oil into your engine? Two of them you may already know. Today I’m introducing a new and unique third way. This is very useful for when you’re traveling and you find your oil level is low. 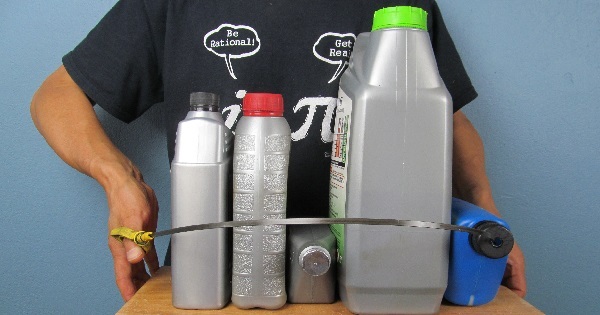 You don’t have to buy a funnel or any other tools — just a bottle of oil! Assuming that you don’t have a funnel, knife, or a screw driver, we will show you how to pour oil without spilling! Whether you have a 1-quart bottle or 5-quart jug, we have you covered. And you’ll impress your friends! Since there are different kinds of oil bottles and different kinds of cars, we have done extensive research to cover all possible scenarios. Hopefully you will find the solution to suit your needs. If you don’t find a solution, or if you have any tips, please leave a comment below. I am not fixing the car body to look 100% perfect, I am trying to save your money by presenting the cheapest fix. If you don’t fix the car, and you’re leasing it, you will not pass an inspection and the lease company will charge you. This will end up costing more. So I’m trying to show you the minimum amount of money needed to pass the leasing company’s inspection. If the area is small you may use touch-up paint. However, it is unlikely the color will match even if the seller guarantees matching based on the color code. I will show you what to do if the paint you buy based on the color code does not match your car. Conventional advice is that spray paint looks better. However, if you don’t do a good job, you’ll have a larger mess on your hands. So my approach is to experiment with touch-up paint first. If the color doesn’t match, you can always remove the touch-up paint, change the color, and experiment again. You can always spray paint over the touch-up paint later on. If you rarely work on auto body, there is also no need to buy a buffer. I will show you a DIY buffer using tools you already have. All the odds and ends that accumulate in your garage are not really junk! 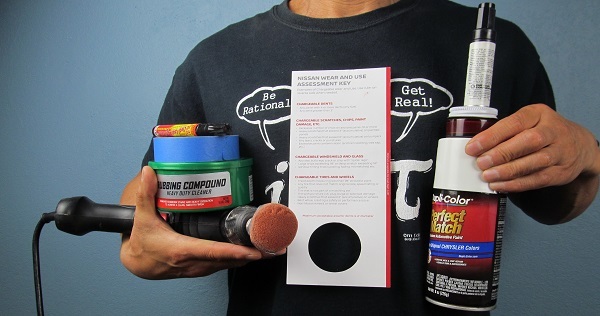 Depending on the kind of scratches you have, I will show you different options for fixing your car (rubbing compound, repair pen, and clear spray). This will give you an idea of different costs, and help you save money and avoid waste. I will also show you the effect of sunlight and shade during different times of the day, so don’t be fooled by how the paint looks under different conditions, and don’t waste your time and money trying to match the color perfectly. There are two issues with fixing an auto body: one is leveling or feathering, the other is painting. For leveling, we will show you methods you can use to restore the shape of the panel when you have a gradual bend and a hard bend. For painting, please check my other video for painting as this video is about fixing the punctured car body. In summary, at the minimum we have shown that you can save $200 on labor costs even if you decide to let a body shop to complete the job. If the bumper is made of fiberglass, then I will need to use Bondo Mat and epoxy to reinforce from the back of the fiberglass. However my bumper is not fiberglass, it is a much softer material. If I glue two different materials together, it is possible it will have the opposite effect, making the crack open more. So I am going to weld the plastic crack. 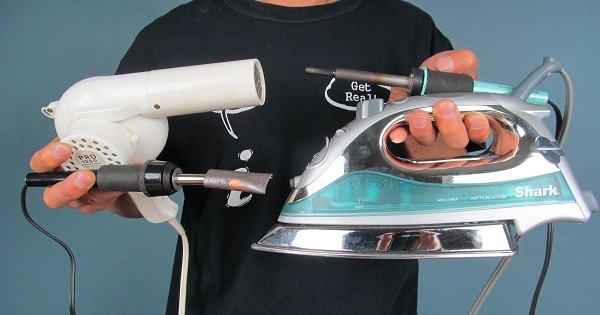 I will show you how you can use a soldering iron to weld it. Today I am going to show you how to remove this front bumper. Originally this was part of my auto body video, check out that video if you are interested in fixing an auto body puncture. This video will save you money. 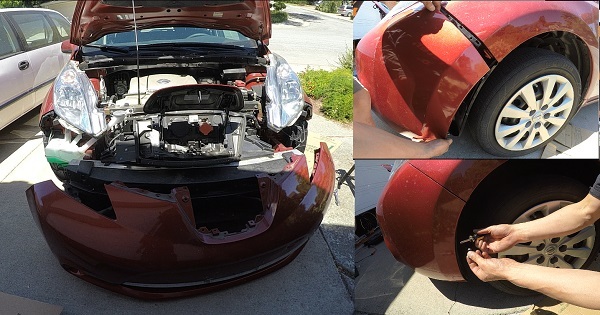 The body shop quoted 2 hours’ labor to remove the front bumper, but you can remove the bumper yourself, and then take it to the body shop for them to fix the puncture, thus at the minimum we have shown that you can save $200 on labor costs. My example here is a Nissan Leaf 2015. Although this video is straightforward with no tricks, I wish someone had shared this kind of idea and video when I needed it. Had I had this information, I could have reduced the time I spent to less than an hour. There are 9 steps in this process. 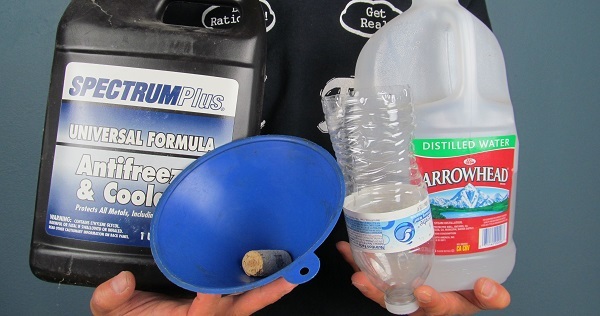 If the coolant level in your car is just a little bit low, you don’t need a gallon of coolant, so how do you mix antifreeze fast without much fuss? I know you can buy premixed 50/50 coolant, but it is more expensive. Depending on what you have at hand, here I will list many different things you may use to mix that little bit of coolant.